Step 2. If data converge, and there is a problem, how big is the problem. Enter Criteria and Data for up to ten measures and 500 students into this template, the template will evaluate the data and tiers of support are automatically calculated. This assessment template is designed to be used with Words Their Way, written by Bear, Invernizzi, Templeton and Johnston. Assess students, and enter their responses then this tool will complete a feature analysis to assist instructional planning. For best results when entering a class, enter most accurate results first,use the summary tab to help with grouping. The paper pencil version of this assessment template is found in appendix A of the text. There are three different initial assessments that can be used from the text. Using this template you will be able to enter the responses of a single or all students in a classroom and quickly determine a starting point for spelling activities described by Bear, et al. This template is intended to be used in conjunction with Cut Scores (i.e., Cut Scores to ISAT, DIBELS Benchmark scores or similar), as a part of formative or summative program evaluation using CBM, TEL, DIBELS etc. It provides a simple visual of progress from one time to the next. Note in order to use this file at this time, you must do your own counts. 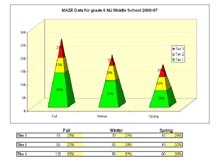 This excel worksheet properly displays simple triangle charts in which the the number of students determines the height of the triangle while the percentage of students within each performance category is presented within the graphic. The analytical benefit of this chart is it allows the viewer to see not only how many students fall within each category, but also if the number of students tested has changed from season to season. Another variation of the triangle charts. 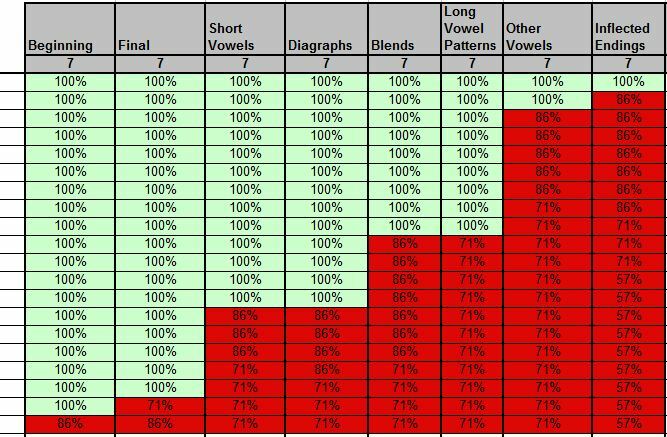 This excel worksheet allows the user to create simple triangle charts that display the number and percentage of students in each tier in an RTI system. this chart allows for further customization of chart labels within the template. This template is set up for tracking 4 point rubric data. Enter student data, then examine individual profiles or group summaries. This gradebook allows the user to specify weights for Academic and Behavioral Components of the academic grade for a ten week period. A unique feature of this gradebook is the ability to dynamically graph any student's formative information as compared to criteria set up by the teacher.